Here what my better (worse?) half came up last night as a starter after she found a good bargain at our nearby Coop Supermarket. Plenty for two, thw fish costing only 440 yen! 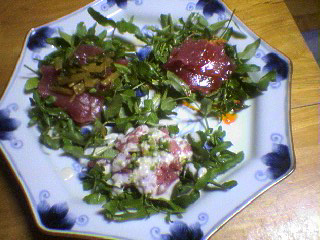 -Maguro akami/maguro zuke (lean part of the tuna marinated Japanese style) topped with “shigeki rayu” (Chinese style hot sesame oil) dressing from Ishigaki Island, Okinawa. Now, there is tuna and tuna. Briefly said there many species with many names and very different price tags as well! 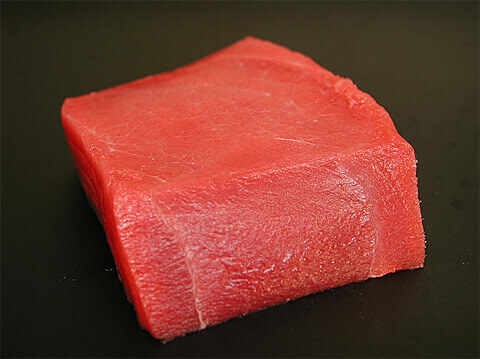 The first species I would like to introduce is “Kuromaguro”, or Blue Fin Tuna (or Tunny). It has many other names in Japanese: Honmaguro, Maguto,Meji,Yokowa, Shibi, Imoshii, Shibimaguro, Kuroshibi, and Hatsu! The best are caught in Winter mainly in the seas off Kochi (Shikoku Island), Miyagi and Hokkaido Prefectures. This variety is the most expensive and can reach astronomical prices, especially caught in Witer off Hokkaido. 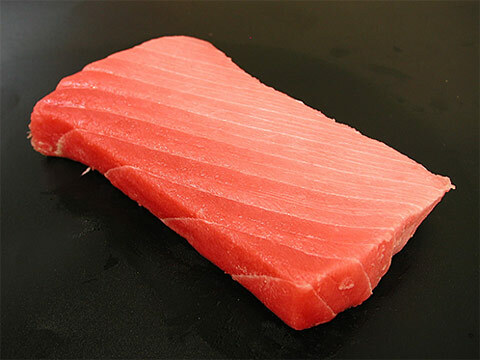 Imported Kuromaguro usually reaches Japan frozen, but in recent years the fish has been successfully raised in semi-wild environments in Spain, Australia and Croatia and arrives in Japan fresh by plane. 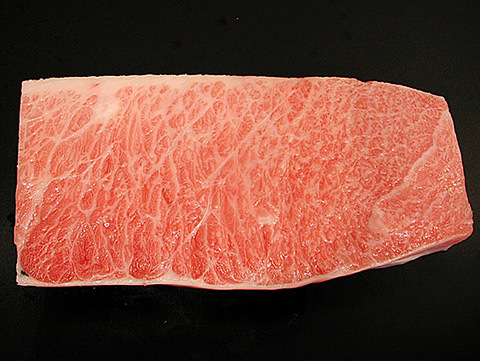 Import and sale of Kuromaguro are monopolised by Japanese trade associations, unless you are lucky enough to catch one (careful here as poaching is a major offense in Japan!). Between you and me, if you want to eat Kuromaguro sashimi, it might come cheaper if you do it while travelling in Spain! Did you that Japanese importers will fly to Spain and other countries just to check that the fish are bled properly? Well, I suppose I finally had to come to it! The truth is that most expats are just crazy for rolls! Whereas samples in the States in particular tend to become full meals by themselves, I prefer them Japanese-size, affording me plenty of time to savour them! The scallops are first mixed with wasabi mayonnaise and coarsely crushed peanuts before rolled in an “inverted” (seaweed on the inside) and coated with sesame seeds. 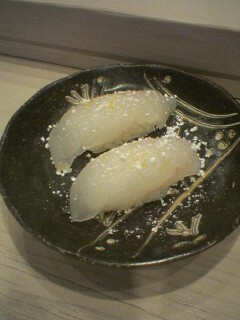 This roll is exactly the same, although the shape in “petals” is typically Japanese. Instead of sesame seeds, it is coated with “Tobiko” (flying fish roe) which apart of their great colour are succulent and crunchy! 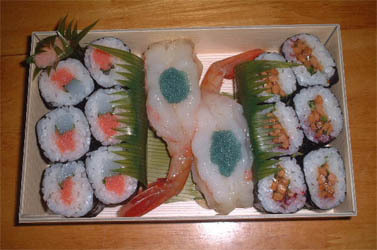 Both above rolls were ordered at “Sushi Ko” in Shizuoka City, Aoi Ku, Aoba Koen. Now this one will please my North American friends! It was made by my better (worse?) 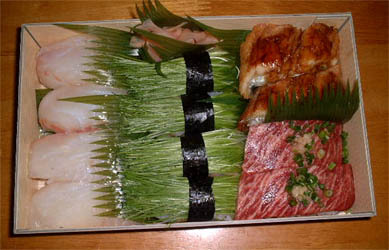 half as part of a “bento” lunch box. 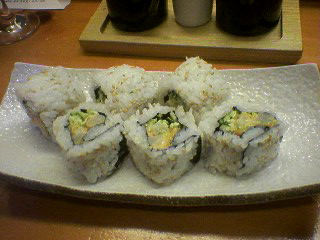 She calls it “tonkatsu maki”, that is, deep-fried (schnitzel-style) soft pork cutlets that she has let cool down first. 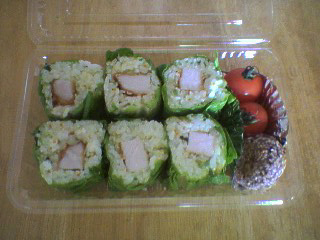 She then rolled them in sushi rice to which she had added wasabi mayonnaise and sesame seeds before rolling them in lettuce instead of seaweed. I have to admit it is a favourite of mine! a) They will prepare them only if you promise to eat them as soon as possible. b) They will either propose you regular sets or indulge you with whatever you wish. Here is what I asked recently for a meal with my wife. I must it was absolutely extravagant! 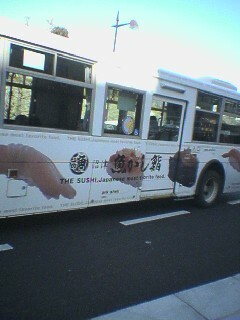 Aren’t we lucky to be able to learn about sushi on buses in Shizuoka City! 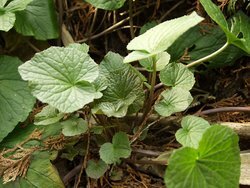 Did you that wasabi originated from Shizuoka City? Around 1600, farmers in Utougi District, some 33 km from Shizuoka JR STation along the Abe River, first started experimenting with the culture of that particular plant, which they already knew as a vegetable used for pickling. At the time they were only processing the stems, leaves and flowers. 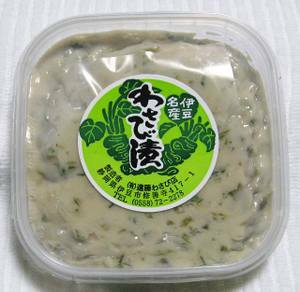 This is still a very popular kind of pickles in Shizuoka where they are sold in season. In 1604, Tokugawa Ieyasu, who had just moved to Sumpu (presently Shizuoka City), grew extremely fond of the grated root and helped spread its use all over the country. Its present culture has expanded outside our Prefecture, especially in Nagano, but Shizuoka still produces the best In Utougi and in the Amagi Range in Izu Peninsula. 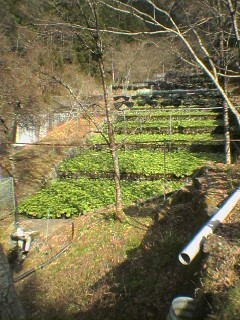 The above-ground part of the plant is also used for making delicious “wasabi zuke” with “sake kasu” (Sake white lees). You can imagine why Shizuoka products are of so high quality when you realize what “sake kasu” is being used! 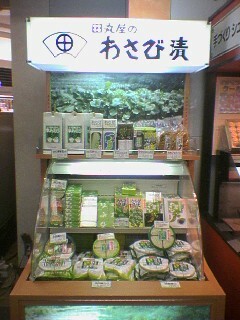 In my own biased opinion, the best “wasabi zuke” is made by Tamaruya Company in Shizuoka City. Above picture was taken in Haneda Airport where the Company has its own stand! 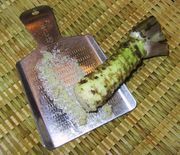 Now, if you want to buy and serve your own “wasabi”, which I would recommend to any real Japanese cuisine amateur, you will need a wasabi grater. If you want to visit Utouki, where you will find a soba restaurant and other shops as well as the possibility of trekking and festivals watching in April and October, either go by car (55 minutes) or take a bus (bus platform 7 at Shizuoka JR Station/75 minutes). The trip along along the Abe River is worth it with all the changing landscapes! Now, you might know it, but thinly sliced wasabi root is not as strong as grated wasabi. In Shizuoka, as it is not that expensive, try and ask your favourite sushi chef to cut it in very thin strips and roll as it is in a “maki”. 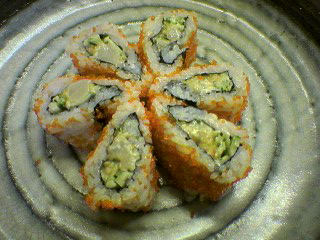 It’s called “bakudan maki” (the real one, not the buster made with grated wasabi!). A favourite of mine! 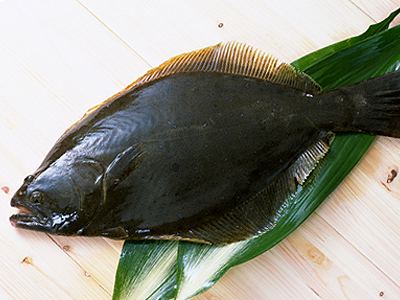 “Hirame” could be translated in many ways depending of your country of origin: Flat Fish, Sole, turbot (although the latter should define “karei”) and what else. There are many varieties, wild or human fed. In Japanese, the names are numerous: hirame, Ooguchikarei, oyanirami, etc. The best season is Autumn to Winter. 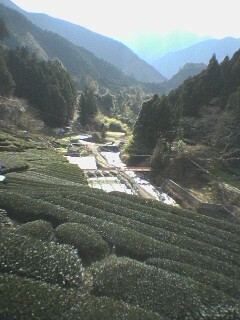 They are still available until Spring in Shizuoka Prefecture. Wild ones come from Hokkaido and Aomori. 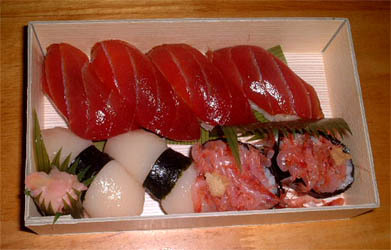 Human-fed ones mainly hail from Oita, Ehime, Mie, and Kagoshima Prefectures. The domestic wild catch is around 7600 tonnes a year, while human-fed fish amount to around 7100 tonnes a year. A recent increase has been observed in recent years, though. A lot are imported from Korea through Fukuoka and Shmoseki. 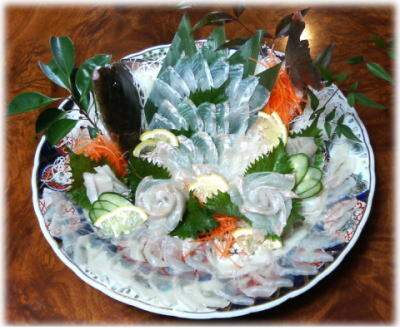 Hirame can be enjoyed as sashimi, cut in various thickness, according to the chef’s preference and presented artfully. I like both sashimi and nigiri, but in the case of nigiri, I have a marked preference (see pic above taken at Sushi No Ichi, Shizuoka City): Seasoned with a little lemon juice or yuzu (if available) and salt (preferably “snow salt” from Okinawa), eaten as it is with no shoyu!